Scott Halasz | Greene County News Fran DeWine, wife of Attorney General Mike DeWine, was the guest speaker at the Xenia Rotary meeting Tuesday. She talked to Rotarians about her and her husband’s involvement in Hands Together in Haiti, a nonprofit organization devoted to educating, inspiring, and encouraging people to understand the importance of responding to the needs of the poor and disadvantaged. Hands Together has emerged as a key educational and development organization working in Haiti’s largest and poorest slum, Cite Soleil. The organization has helped build the Becky DeWine School — named in memory of the DeWine’s daughter — where there were none and provided every student with a daily hot meal. There are eight campuses, including a high school, as well as a free clinic and an elderly outreach and housing program. 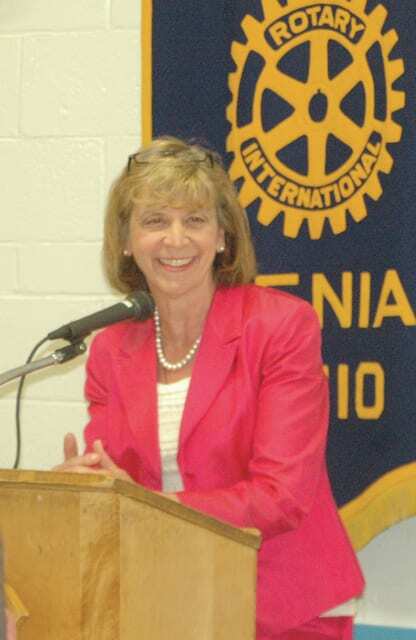 Fran DeWine, wife of Attorney General Mike DeWine, was the guest speaker at the Xenia Rotary meeting Tuesday. She talked to Rotarians about her and her husband’s involvement in Hands Together in Haiti, a nonprofit organization devoted to educating, inspiring, and encouraging people to understand the importance of responding to the needs of the poor and disadvantaged. Hands Together has emerged as a key educational and development organization working in Haiti’s largest and poorest slum, Cite Soleil. The organization has helped build the Becky DeWine School — named in memory of the DeWine’s daughter — where there were none and provided every student with a daily hot meal. There are eight campuses, including a high school, as well as a free clinic and an elderly outreach and housing program.